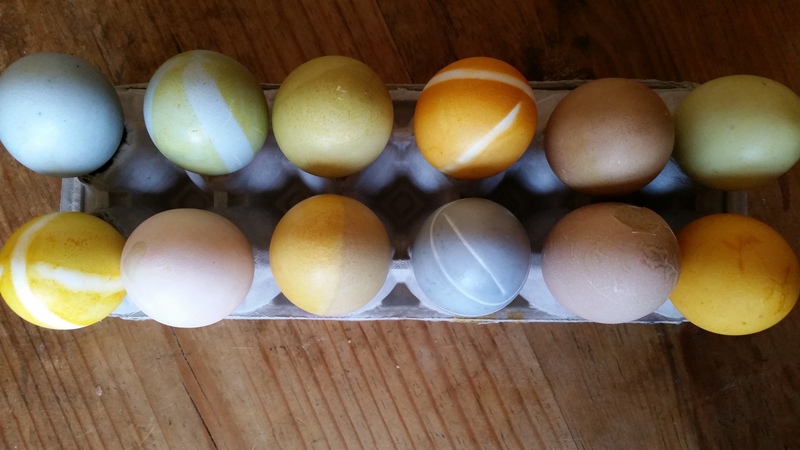 New colors for naturally dyed Easter eggs! 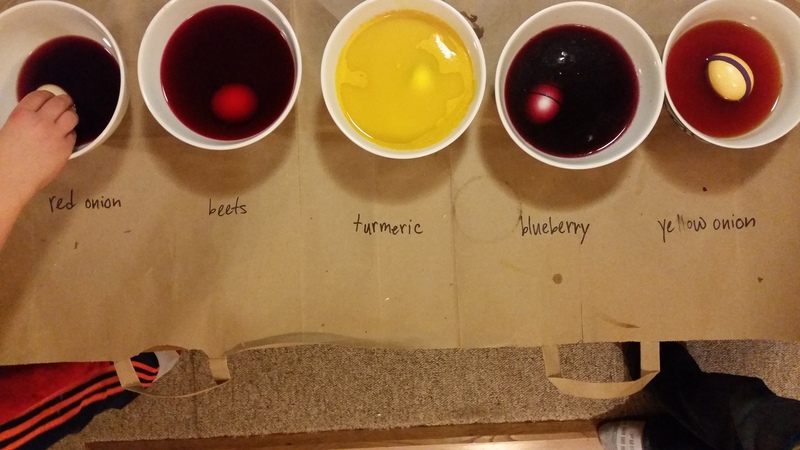 A couple of years ago we started coloring Easter eggs the natural way, with vegetable and spice colorings that can be teased out in a few minutes of boiling, steeping and straining. 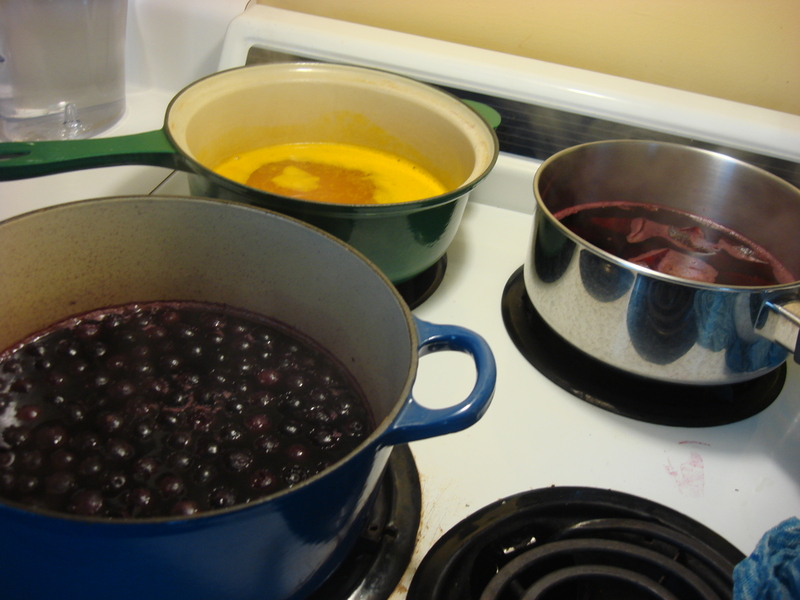 Our first colors were beet-derived pink, turmeric yellow, and blueberry purple-blue. 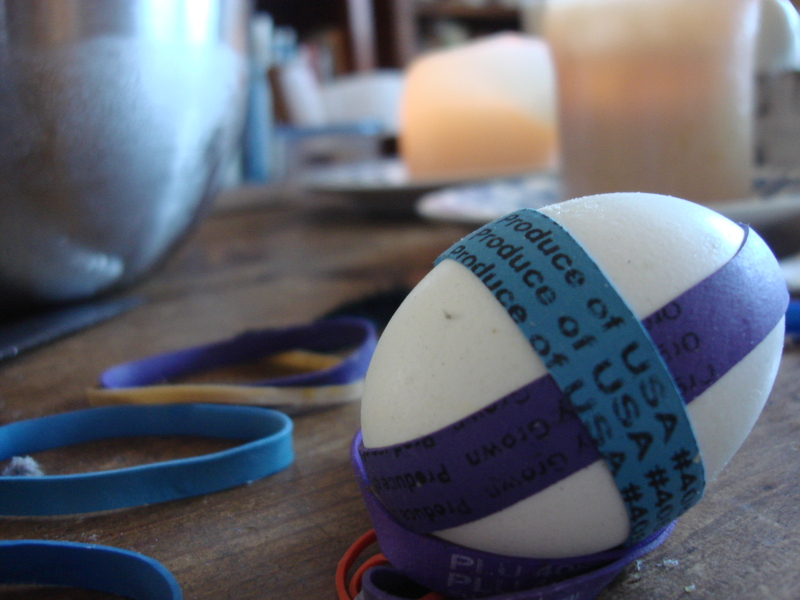 This year we added two more to our palette: red onion, which gives you a sort of earthy khaki color, and yellow onion, which tints the eggs a marvelous glowy yellow orange. Put one coloring ingredient in each pot. Bring to a boil, turn off and let steep five minutes. Strain into three separate bowls (removing chunky bits*). Add 2 Tbs vinegar to each bowl. Start blending, dipping and cross-dipping until you achieve the colors you like. Dry in the egg carton and add any decorations you see fit. Put one coloring ingredient in each pot. Bring to a boil, turn off and let steep five minutes. Strain into three separate bowls (removing chunky bits*). Add one tsp vinegar to each bowl. Start blending, dipping and cross-dipping until you achieve the colors you like. Dry in the egg carton and add any decorations you see fit. 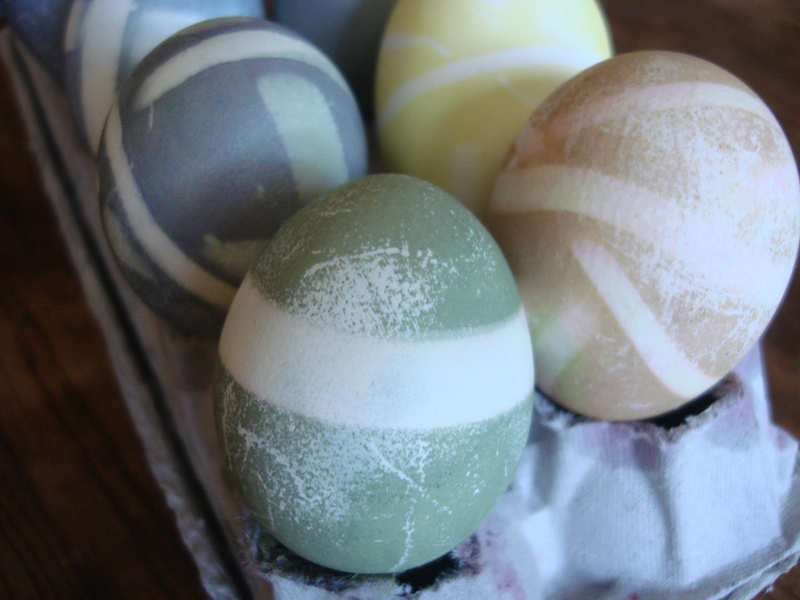 Natural Easter Egg Dye: It Really Worked! 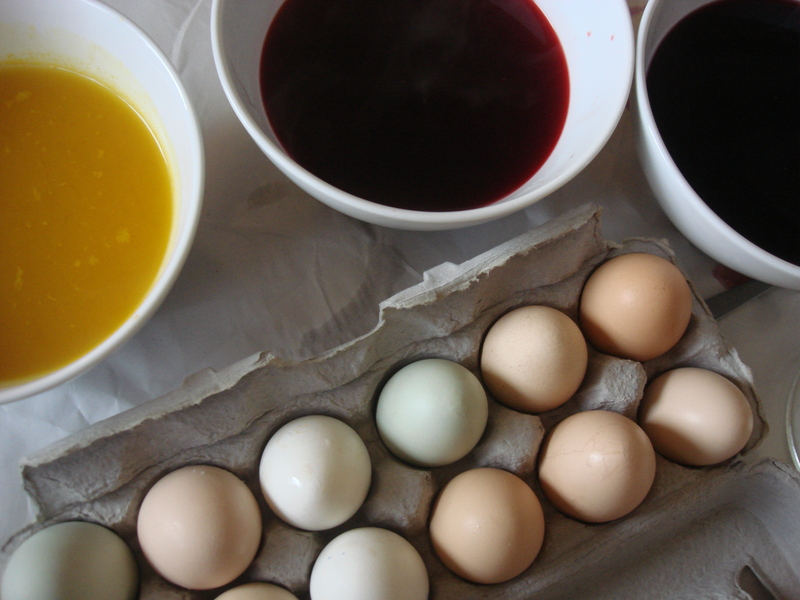 Thanks to two bloggers working together, Leandro and I were inspired to try our hand at natural Easter egg dyes and it was so, so, much fun! My friend, Ashley, posted a “fun Easter craft” on the Hot, Cheap & Easy Facebook page recently. It linked to Lisa Leake’s 100 Days of Real Food a terrific blog about her adventures, discoveries and triumphs eliminating processed food from her family’s diet. 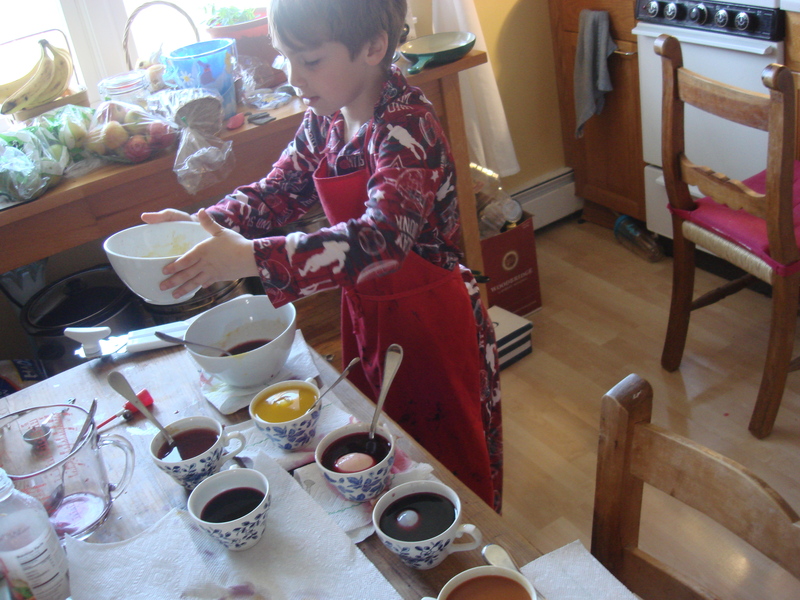 The original post was Natural Easter Egg Dyes and the guest blogger was Christina Le Beau whose blog, Spoonfed, covers her quest to raise children who are literate about food. Women after my own heart.